Have you been planning to set-up your own gym at home? With this amazing set of dumbbells, you can automatically change your resistance from 5 pounds up to 52.5 pounds of weight by just turning the dial placed in each dumbbell. Hence, you’ll no longer be hassled to pick-up 30 various dumbbells as you do your workout because these adjustable dumbbells weighing 52.5 pounds each, are designed to do-it-all and surprisingly replace up to 15 sets of weights. You can also visit here for the possible accessories or any other brand model. #2: Yes4All Adjustable Dumbbells 40 lbs. These Adjustable Dumbbells have been designed with ergonomic textured solid chrome handles as well as secure spin-lock Star collars and high performing rust resistant solid castiIron plates. These type of adjustable dumbbells don’t need much space and this actually allows you to have different workout routines with varied weights from the very start up to the next level by changing one plate to another simultaneously while training various muscle groups for the muscle and strenght in your biceps, triceps and the whole arms, back and shoulders. This set includes 2 pcs. Dumbbells with 40 pounds in total; 2 pcs. 14″ x 1′ handles; 4 pcs. 3-pound plates; 4 pcs. 5-pound plates and 4 pcs. collars. For the other sizes, try to visit here if there are any available today. With durable cast iron plates that lasts for a lifetime, painted in black to prevent rush. These AmazonBasics 38-pounder adjustable weight set has been designed for beginners and veteran fitness folks due to its versatility to provide the needed tools for creating your very own workout routine with the weight amount of your choice. The weight set includes 2 barbells, 4 5-lb plates, 4 2.5lb plates and 4 collars – a set that can work everything from your shoulders and chest to your triceps and biceps. With this set, you can start from lower pound and then slowly add more as you progress with your workout and you can just easily adjust the amount of weight by either adding or removing the iron plates and then don’t ever forget to secure these with the threaded collars for your safer workout. If you are looking for another pair, try to visit here if there are any available today. This adjustable dumbbell set is small but convenient and easy to use and store. With its versatility, you can execute different workouts by simply changing the weights according to your preferred exercise and amount of weight you can handle. As not every fitness folk is willing to store more dumbbells at home, this space-saver set is definitely perfect for your home workout routines. This set comes with a pair of brand new 105 pounds adjustable dumbbells – 52.5 pounds x 2 pcs. ; 5 pounds x 16 pcs; 2.5 pounds x 4 pcs. ; 1.25 pounds x 4 pcs. ; handle x 2 pcs. and collar x 2 pcs. For other available set, you can try visit here if there are any today. This Merax adjustable dumbbell set is an all-in-one equipment great for upper body workouts which helps you build and strengthen your muscles on your biceps, triceps and the whole arms, back and shoulders. With this innovative product, you’ll no longer waste your time removing or adding more dumbbell plates in between sets of your workout because this hi-tech dumbbells feature a unique dial system and plates in different sizes allowing you to quickly adjust the weights in an effortless twist from one to the next exercise. These dumbbells come with a nice tray and a cute stable rack for their secure storage which keep your little home gym well organized without occupying much space. This product provides you a wide range of weight which starts at 11 pounds all the way up to 71.5 pounds and the weight is adjustable in 5.5 pound increments that offers 12 various weight settings to opt from. If you’re looking for another brand model, you can also visit here if there any available today. Each dumbbell adjusts from 11 pounds to 71.5 pounds in 5.5 pound increments. Omnie Adjustable Dumbbells is with high quality and durability made from high performing rust resistant cast iron with chrome handles and spin-lock collars for a secure and strong fit. These kind of Adjustable Dumbbells are very easy to set up requiring no tools to use, no much storage space needed that allows you to do various kind of workout with interchangeable weight plates that are easy to use, store and maintain. With Omnie dumbbells, you can do your workout in different muscle group simultaneously or one muscle group at a time to gain your muscle and strength on your shoulders, back and arms. This comes with a set of 2 adjustable dumbbells – 5 to 100 pounds in 5 pounds increment; 2 pcs 16″x1.1″ handles; 16 pcs. 10-pound plates, 4 pcs. 5 pounde plates, 4 pcs. 2.5-pounde plates; 4 pcs. collars. If you want to see another pair, try also here if there’s any available now. 2 pieces 16-inch textured chrome handles coated in high-quality chrome for a secure and slip grip. #7. Weider Speed Weight Adjustable Dumbbells – 2.5-12.5 lbs. This great brand offers a complete set of dumbbells through these space-saving two adjustable dumbbells weighing 2.5, 5, 7.5, 10, or 12.5 pounds respectively. This amazing adjustable dumbbells are so easy to use and you can just adjust them quickly through the knobs placed on its end part. These great pair of dumbbells are adjustable from 2.5 to 12.5 pounds with soft-grip handles for your comfort and safe workout. A truly convenient gym equipment as you can just quickly change the intensity of the dumbbell weights in between sets. This product includes a pair of dumbbells as shown above and it comes with a nice tray for the easy use and storage. This adjustable dumbbell set is made of Vinyl and comes with two ( 2 ) steel bars as well as collars to secure the plates don’t move and fall, for a safe workout. These Gold’s Gym dumbbell pair has the cement-filled plates which conform to the lifting model and standart and is perfect for either beginners or veteran fitness folks. This 40 pounder hand weights pair is designed to enhance your confidence, health, strength and develop the muscles in your shoulders, arms, back and even legs for a total-body workout. You can also try here, if there are any other available set or brand model now. These new adjustable dumbbells provide you a very convenient workout experience as you’ll be changing weights with the simple twist of a handle in 5 pound increments without any knobs to slide or turn. 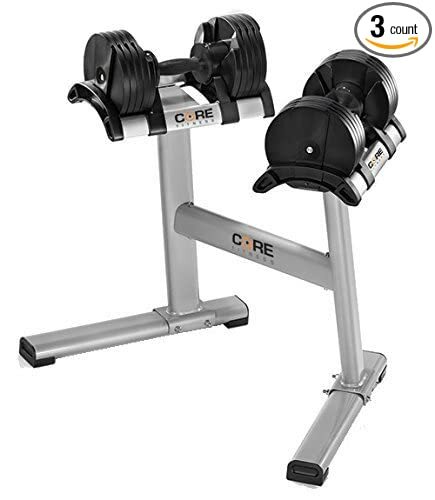 Core Fitness adjustable dumbbells provide you a 10-piece set in just a single dumbbell with a lightweight but durable aluminum cradle. Try also here, if there are any other pair or other brand model available now. With this 33-pound dumbbell chrome set, you can absolutely maximize your workout session as it allows you to fully customize your workout routine with these 8 pcs. 2.5-pound plates and 4 pcs. 1.25-pound plates. These plates come with the textured grip with solid steel handlebars ( weighing 2.75 lbs.) that secure a really tight grip along with the steel cogs ( weighing 0.55 lbs. ) which also ensure the plates are not moving, for your safe workout. With this pair of adjustable dumbbells, you’ll definitely be able to ensure a slowly but surely strength workout routine with your arms, shoulders, back and legs. For other available pair, you can also try here if there’s any today. Skipping a gym workout session can’t really be avoided sometimes due to some reasons and it’s a good thing to have a great pair of adjustable dumbbells available at home that you can always count on! To guide you further, you can also visit here to know what are the ideal home gym equipment you can start with.